This photo was taken two years ago when we had the back to back blizzards in the area. The shot was after the sun came out after the first storm. 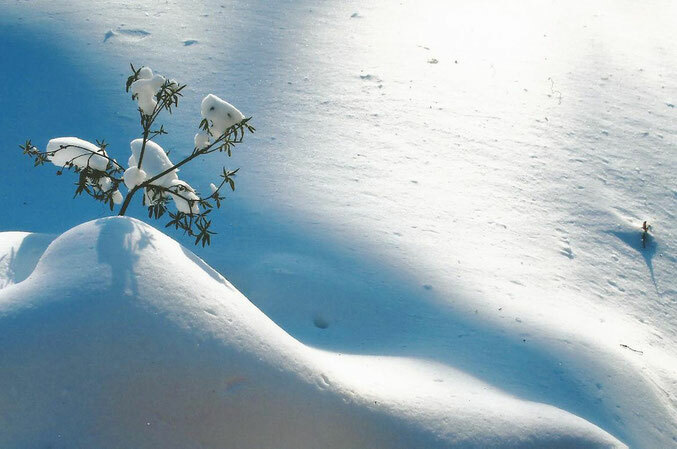 The location was through my front window, looking down on an azalia bush that had been quite overwhelmed with the snow. So much so that the volume and weight of the snow had almost crushed the branches of the bush. The "Take it!" Quite honestly came out of pent up cabin fever. I had taken inside photos some of which I will share with you, a stretch of the imagination just to pass time. To finally have a break in the weather had me shooting all sorts of snow and sun pictures, lots of fun. The "After Take" People have told me that this almost looks like a ski slope in the background. We got the walk shoveled out and the car dug out ready for the snow plow to arrive to free our street. There is such a great sense of community when this sort of thing happens. I do not think I have ever met anyone that comes out to walk in the snow when the street is closed that has a grumpy way about them. It is an unusual time, sort of joy, one thankfully readily shared. Many thanks for taking time to learn of the background for our theme banner for this powerful season. Lets hope Mother Nature chooses to bestow its beauty upon us this winter, and saves havoc for another year. We don't get snow like this out my way. I am jealous in the sense that I miss being able to play in the snow and I'd love for my kids to be able to experience it; however, I can't say I miss blizzards very much. Just stumbled on this site from a friends facebook. First picture i look at is this one and i gotta say its flippin' awesome! I can see why you went with this photo for the banner. Its really a great shot. I seem to remember a few months back the website banner was autumn leaves. Do you guys change the website banner based on the season of the year?